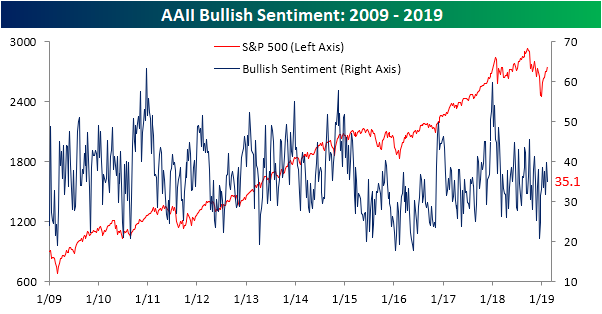 Sentiment pulled back slightly this week but has maintained a fairly optimistic attitude as seen through the weekly AAII survey data. Bullish sentiment fell to 35.1% from a recent high of 39.87% last week. While that is below the historical average, it is well off of the lows of the past few months as markets sold off and is now sitting right in the middle of the range from 2018. Bearish sentiment, on the other hand, remains at multi-month lows but picked up slightly this week. Pessimistic views rose to 25.07% from 22.78% last week. While these readings could seem concerningly low when looking at the past six months or so—meaning from a contrarian perspective it is due for a reversal—it is not necessarily a concern as it is only at a lower range than the indicator has been at for the better portion of the past few years. 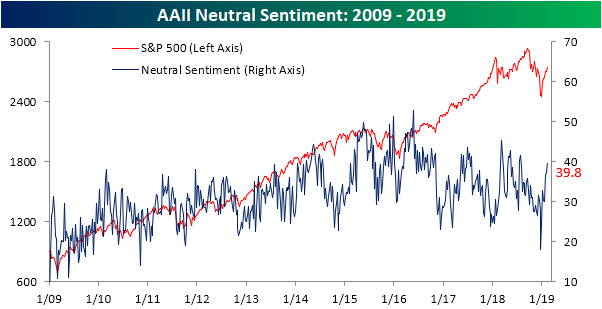 Meanwhile, neutral sentiment has picked up significantly in the past few weeks. This week’s reading of 39.82% is the highest since late July of last year. It is also the fourth consecutive week of an uptick in this sentiment reading. Since the market bottomed on Christmas Eve, neutral sentiment has increasingly become the majority sentiment reading from investors. In other words, as the market has rallied, investors have been less polarized between bulls and bears as they had been during the late 2018 volatility. Rather, investors seem to be a tad more cautious of the markets and have low expectations of bigger movements in either direction. 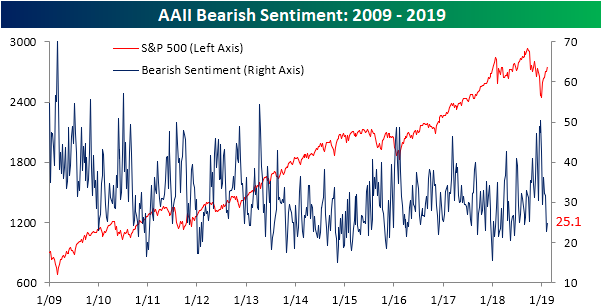 Depending on whether or not a contrarian stance to the indicator is taken, the survey’s recent results have indicated more investors are expecting markets to rally or maintain these levels than continue the sell-off from late 2018.